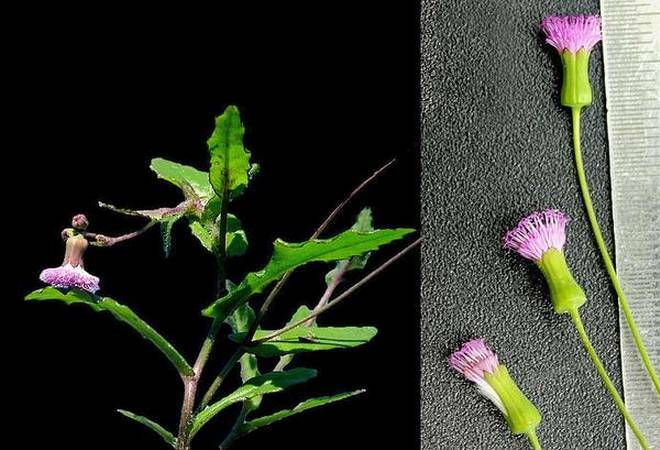 Andhra University's and the National Remote Sensing Centre's researchers, Hyderabad, have found a new plant species in the Eastern Ghats. During field studies on the biodiversity and taxonomy on the hill, a researcher of the Forest and Ecology group of the National Remote Sensing Centre (NRSC), Hydearabad, K. V. Satish, and faculty of the Department of Botany of Andhra University, J. Prakasa Rao, stumbled upon the plant at 1,245 metres above mean sea level. Belonging to the family of Asteraceae, the plant with light violet plum-coloured flowers blossoms between September and February. “We have narrowed down to the family and compared it with three other species of the family and found 23 distinct characters. Usually six characters are sufficient to name a new plant,” Dr Prakasa Rao told The Hindu. “We found it in 2013 and carried out studies using available references in books and expert views and known flora. After completing our studies we sent an article to the Journal of Asia-Pacific Biodiversity, published from Korea, in May 2016,” he said. After it validated the finding through international experts, the article was published in January. The crowned tassel flower has been given the botanical name Emilia reddyi, honouring NRSC scientist C. Sudhakar Reddy for his significant contribution to the field of plant taxonomy and biodiversity conservation in the country. The plant has been deposited in the herbarium of the Andhra University and the Central National Herbarium, Kolkata. During the studies, 70 Emilia reddyi plants were found in a physical survey of 22.6 ha on the Galikonda hill. Through ISRO satellite map and analysis, it has been estimated that it can grow in the vicinity in 2,612.1 ha. Unlike the Himalayas and the Western Ghats, the Eastern Ghats are largely unexplored and the plant is endemic to the area in which it is found, the researchers observe. The area is limited and the number of plants are few . On application of the criteria of the International Union for Conservation of Nature for new species, they have grouped it under the ‘critically endangered’ category. “Using the satellite data from 1973, we could find deforestation due to agricultural expansion, the damage caused by forest fires and the impact on biodiversity by alien species that came to the edge of the forest and could expand further in,” says Dr Satish. State-of-the-art remote sensing technology would help in better conservation of the entire ecosystem instead of focusing on individual species, he points out. Dr Prakasa Rao expressed apprehension that increasing agricultural expansion, rapid spread of alien species and expansion of coffee plantations and the proposed bauxite mining on Galikonda may pose a severe threat not only to the new species but to the endemic species of the Araku Valley and its biodiversity.